One of my favorite things to do, cooking-wise, is to make huge batches of soup and freeze them for later. 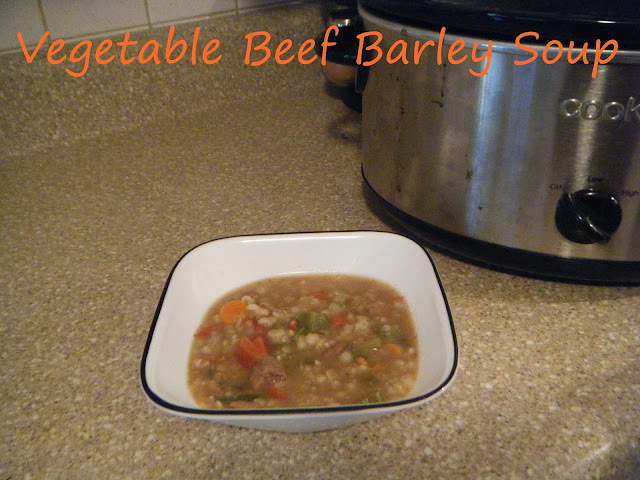 I usually do this in the fall and since we got a taste of it last weekend, I decided to use up some of my CSA veggies and make vegetable beef soup with barley. I based it off of this recipe from Skinnytaste, my favorite go-to site for healthy recipes, but I did alter it a bit since I let it cook in the crockpot while we were out enjoying the day. This was amazing and a new fall and winter soup staple in my house. Heat a large heavy pot or dutch oven on medium heat. Add oil and beef, season with a little salt and brown meat a few minutes then place in crockpot. Add remaining ingredients and cook on low for 6 hours. Even though it has way more than 5 ingredients - which is my max lol - I think I may have to try this. Looks super yummy!!!! That's the beauty of it, you can put whatever you want in it!